Posted: Mon Nov 14, 2011 6:58 am Post subject: Finally got to put the 6mm loads to work! Saturday had a decent 10 point walk out and I got to use the loads I worked up. H4350 behind a 100 gr nosler partition. One shot broadside at about 125 yds and he dropped where he stood. Now, it had been along day and I was worn out, but there was no exit wound, but there was no exit wound to be found. To tell you the truth, I couldn't even find an entry wound. His lungs were jelly so the bullet did its job, but I just can't believe it didn't exit. Otherwise, it felt pretty good to see the load I had worked on do what it was intended to do and to do it using the rifle I inherited from my Dad. 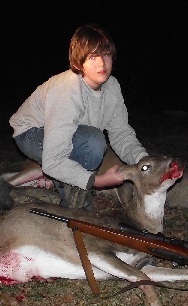 My 13 yr old nephew also took a nice doe with the same rifle and load combination. His was shot at about 100 yds. He pulled the shot off slightly but hit her in the spine. The bullet hit just above the rear of the lungs and cut through the spine like a hot knife through butter! Dropped her where she stood. The rear of her lungs were jelly too so I assume some bone or bullet shrapnel flew down there and tore em up. All in all, the little 6mm did its job well! Posted: Mon Nov 14, 2011 7:12 am Post subject: Re: Finally got to put the 6mm loads to work! Congrats to the both of you !!! When animals drop dead in their tracks exit wounds aren't needed/required !!! Did you recover the bullet ??? Posted: Mon Nov 14, 2011 7:20 am Post subject: Re: Finally got to put the 6mm loads to work! No I didn't. We got started at 2 am and by the time he hit the ground I was worn out. So we gutted and other then running my hand along the inside of his chest feeling for a hole I didn't put much into it. I would have liked to have found the bullet, but all that matters to me is that they both went down. I agree exit wounds matter very little to me. Thank you for the congratulations. That doe of his was the greatest deer ever to him and I was pretty proud of it for him too. Been waiting to take him hunting with me since the day he was born and now he is hooked! Posted: Mon Nov 14, 2011 7:56 am Post subject: Re: Finally got to put the 6mm loads to work! Posted: Mon Nov 14, 2011 8:16 am Post subject: Re: Finally got to put the 6mm loads to work! OOOOOoooooooo very nice pair!!! They both look beefy and fat too, good job! Posted: Mon Nov 14, 2011 1:40 pm Post subject: Re: Finally got to put the 6mm loads to work! great job getting the youngun a deer. good to hear the 6mm is dropping them for you, as has been said if they drop a exit hole/blood trail is irrelevant. you could try a Barnes type projectile if you are concerned by this. even if you find one that shoots OK you could use them for the scrub shots and use your super duper accurate load for the long shots. Posted: Mon Nov 14, 2011 3:25 pm Post subject: Re: Finally got to put the 6mm loads to work! The partition load is pretty accurate. At 100 yds three shots touch as long as I don't screw it up. And I am not overly concerned with an exit wound as long as the deer hits the dirt. Where I hunt is right on the border of the neighbors property so I had been concerned about the deer running in the wrong direction, but that was not a concern! I have no complaints at all, just assumed the bullet would exit. Posted: Mon Nov 14, 2011 3:46 pm Post subject: Re: Finally got to put the 6mm loads to work! Cant top that....that's what it's allabout. Congrats to you both. Posted: Mon Nov 14, 2011 5:10 pm Post subject: Re: Finally got to put the 6mm loads to work! Congratulations - Nice deer, great shooting. Awesome to share your nephew's first deer hunting experience. Congratulate him for us. Posted: Mon Nov 14, 2011 7:40 pm Post subject: Re: Finally got to put the 6mm loads to work! congrats, cb27! What velocity do you achieve from the short barrel rig? Posted: Mon Nov 14, 2011 8:19 pm Post subject: Re: Finally got to put the 6mm loads to work! 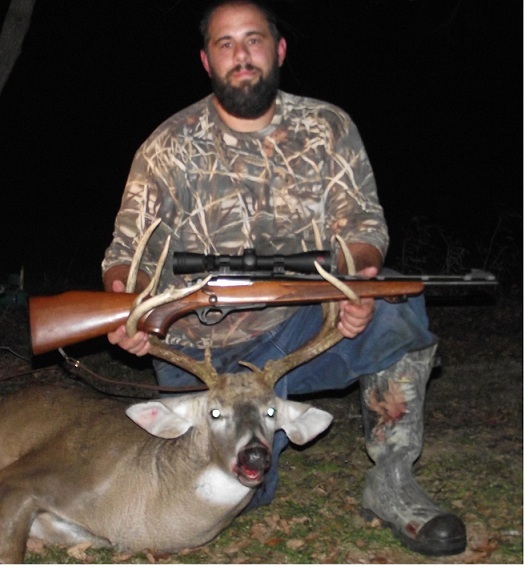 Nice deer and a great experience for both of you! Congrats! Posted: Mon Nov 14, 2011 9:31 pm Post subject: Re: Finally got to put the 6mm loads to work! Slim Jim, I can't help ya with that man. I don't have a chronograph, just got started reloading this year. Sorry man. Posted: Tue Nov 15, 2011 1:06 am Post subject: Re: Finally got to put the 6mm loads to work! Well done to both you and the young fella Chris...they are a nice looking pair of deer. As Suz says, nice looking beefy critters mate. It great that you have indoctrinated your nephew into the fraternity of hunters mate...he will forever remember his first deer and hunt with his Uncle Chris. I am looking forward to doing the same with my grandsons. Posted: Sat Nov 19, 2011 8:49 am Post subject: Re: Finally got to put the 6mm loads to work! Congrats to you and your nephew on your deer. Nice to see others still using the 6mm. I've shot many a deer and antelope with mine. Posted: Sun Nov 27, 2011 8:50 pm Post subject: Re: Finally got to put the 6mm loads to work!